Explore the many wildlife stories around the world through the year in this charming, interactive set—a perfect gift for young nature-lovers fascinated by wildlife on our fragile planet. 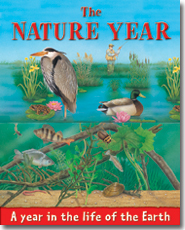 Each of the twelve volumes features the seasonal changes around the globe in a single month. At the end of each volume, there is a set of fun, seasonal activities. Also available as a single volume book.